A: A month-and-a-half long charity marathon benefiting Child's Play. 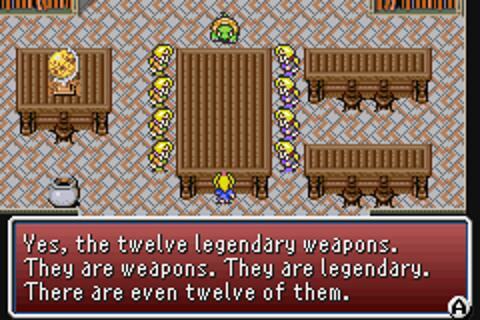 Play Final Fantasy V, on whatever platform you want (SNES, PS1, GBA, phone, Steam, emulator) with the jobs given to you by the custom RNG bot and benevolent overlord, Gilgabot! Q: When does it start? It runs through the end of August, so there's plenty of time and no rush (except for #BERSERKERRISK). You can even register once the fiesta has begun, register for another run after you finish so no worries if you check this topic out later. Q: What do I need to sign up? Also too you can log-in on the website based on your Twitter account and see all your runs from years gone by! Q: How does the four job thing work? In Standard, once you get your first crystal and reveal your first job, your entire party will be locked into that job. As you get the new jobs, you need to have one representative of each available job at all times (excluding when you have insufficient party members to do so, in those cases just make sure everyone has a different job). You can swap jobs as often as you want within that limitation, and mix and match the abilities you learn freely. This is what you will sign up for by default. In Natural Only, each character is locked to Freelancer until you get their respective crystal - at which point the character is locked forever into whatever job you got for that crystal. No mixing and matching jobs. This is the tougher one by a significant margin! Fifth Job will overwrite your prior Earth Crystal roll with a new job (following whatever run type you are on) when Krile joins your team. You can't use any skills from your prior final roll, so a sort of do-over but only for the 4th job. Q: Which run choice do I pick? Regular is the original mode, you will receive one random Wind, Water, Fire, and Earth job at each crystal. This is what I'd recommend for a first timer. Random will open up additional jobs for each crystal - any job that you haven't obtained yet that is also up for grabs. For instance, the Water crystal may also unlock a new Wind job instead, and the Earth could hand you any job in the game. You're more likely to receive jobs from the first crystals as a result, and less likely to see an Earth crystal job. Chaos Mode is similar to Random, except that any job is up for grabs for each crystal. This means you have a pretty decent chance of not getting a job from the Wind crystal and needing to No Job Siesta a bit longer. This mode also enables the possibility of rolling the same job for multiple crystals! Popular Mode is similar to Chaos Mode, but it's weighted towards jobs that were voted for on Twitter last year which is skewed towards mages IIRC. Chaos mode for people who are afraid of getting 3 Geomancers and a Dragoon, basically. Pure Chaos Mode is if you want Chaos but don't want dupes. As a bonus Mime and Freelancer are also up for grabs! ......yeah we have no idea what signing up for a Forbidden run will do yet. A: Based on the amount of donations received before preregistration ends vs the number of players who signed up for this, those players will be guaranteed to receive at least one Berserker and maybe more depending on job mode! You can only sign up for Berserker Risk before the Fiesta begins so choose wisely. They're quite a challenging class to work with due to really being entirely out of your control, but that doesn't mean they're bad. Just brace yourself! In my opinion/experience, having just one isn't much of a liability outside of a few battles and for some teams it'd be a great source of damage throughout the game - let me tell you about the year I had Team Tickle Kitten Berserker Babysitters Club. If you really want a risk, make sure to sign up for Chaos or Random! A: What a great time to come play the best one! Our buddy Garlyle is some sort of FF5 Wizard and wrote a handbook (it's written using SNES terms, but a number of us in here can translate so don't be hesitate to ask for clarification!) specifically oriented towards the FJF that covers more or less everything you'd ever want to know to make the most of the game's mechanics, the classes you've drawn, to help you figure out boss strategies, etc. Also, MotK has several veterans of this challenge, and we'll always be available to offer a helping hand if you stumble or just run face first into a brick wall. And yes, this is totally a great excuse to play FFV for the first time! FOR NEW PLAYERS: I recommend doing a Normal run for your first playthrough. Even the "worst" combo you can get still has some tricks up your sleeve. Q: Is there any way I can watch someone miss on Byblos 6 times in a row and laugh at her misfortune? A: A few of us will be streaming our runs! Come check us out, subscribe to keep on top of stream times and post if you got a link I missed! ALSO ALSO what do we all think ~forbidden mode~ is? This year it's magic time with a Rando 750 squad. There's still a 10% chance to wind up with a dancer somewhere in there! Also get your donations in kids ffs. Ya fren variety is the spice of life. Roll for classes that you can't use...? Roll for a randomly assigned run type? Going regular ol' chaos to start. My guess is Forbidden will be inverse Popular (heavily weighted against the Twitter poll votes). So I wonder if it's some sort of scout's honor mode banning an aspect of your assigned jobs. Got up to Water on a Chaos run. Wind was Ninja, Water is Chemist. Blue mage out of the gate which means I've already won but I started Team 750-330 so I could get classes I didn't have before. It's a blessing and a curse all at once. Also when you've had BESTmaster so many times, you do get a bit weary of having classes that involve a lot of homework. Oh well. Nothing wrong with a strong utility guy. I reserve the right to peek ahead and reroll my other classes if I've gotten them all before, though. Just what kind of stuff is the geomancer capable of, anyway? Can it swing 2k-4k damage on an entire enemy party with some degree of regularity? Or does it do 500 damage to one section of NED one turn and then poison your part on the next? I do not have any frame of reference here outside of geomancer being derided. Probably deservedly so considering how much I've used it in the several times I've played through the game. When all else fails, at least it's a back row item bot? EDIT: A quick bit of homework found a handful of things that amounted to a whole lot of whatever. Their damage is modified by their magic score which is alright, but that can be improved. Damage can be further boosted by equipment that boosts damage for particular elements. The chance of doing one type of move over another varies a whole lot depending on where you are. There are bunch of nuances around some of the bells like the rune, diamond, and gaia bells. The level of the geomancer affects the ability used much like the ranger's !Animals skill. The skills used have a bunch of different effects, but they can be heavily situational. This includes some stuff that might work like... maybe Whirlpool on Gilgam3sh and some other things? Still, this all adds up to a class that can help plow through mob fights in a dungeon with some questionable RNG but won't help surmount big obstacles outside of some spare damage and occasional status effects. It only gets better from here on in. I wanted to try a Chaos Run, but Forbidden decided to take it instead. I got Thief for Wind and Red Mage for Water. Naming Bartz Snacks was the right decision. Lenna asks if snacks are coming along to the wind shrine, she calls out for snacks in the middle of the night in Tycoon castle, and the siren in the ship graveyard beckons for snacks to come to her. Rolled summoner for my fire job. I already had the game set between a blue and time mage, but I've never had a straightforward mage class, nor have I ever really had any class that does AoE damage. The only reason I was dismayed by both blue mage and time mage was because I had done some stomping with them already. I got Samurai for my Fire Job, so I am guessing there's a little bit of Chaos in there. Who has two thumbs and waltzed into the library with a full party at level 15? Oof. Forgetting that is one of the worst things ever. I forgot that one as well, but I was level 16. I got Gladiator as my Earth Job, but I won't even get to use it, since I'll have to change when I get Krile. Okay I wanted to have some mages kick some tail this year but having a blue mage and summoner wombo combo is just silly. It's not a high synergy thing by any means but having this much utility and damage together has helped make everything past Walse a breeze. Going into the Sandworm fight soon with Aqua Rake, Shiva, and breakable rods. Oh and time mage plus healstick just in case I get too lazy. Maybe next year I'll do something as crazy and occasionally rough as my first year doing things. EDIT: Yeah, I got white mage for my last class. Blue mage, time mage, summoner, and white mage. Yup. The true boss of a team made up exclusively of magic users is the menu. Oh look your avatar is spot on all over again. Right now I'm at Blue/Berserker/Geomancer. Been busy this last week so haven't gotten the final crystal yet. But like. At least I don't start using Berserker until after the fourth crystal? Death Claw worked on Dragon Pod and that fight lasted all of 1 turn. Death Claw did NOT work on Boatgamesh. Dark Spark and Level 5 Death sure did, though. Oh Blue Mage u so silly. At the end, I got Thief / Red / Samurai / Gladiator. And I just lost Red to the Void, so no Rod anymore. Gonna have to be creative for Shinryu. Team magickery is smoothly progressing and has been a fun combo. The team is real well balanced magic-wise, making things simple but fun even when it's a bit menu heavy. This feels like it's going a bit fast but between summons and magic spells I think I'll go through all the major dungeons in world 3. Pure Chaos this year has given me Bard, Berserker, Monk, and Freelancer. Commence three angry punchmen and their one sane Bard friend. Exdeath actually posed much more of a threat because I couldn't rush him and had to spam Elixirs, but at least it worked. Page created in 0.057 seconds with 40 queries.